This January Special is so hot . . . This January Special is so hot, it’s like warming yourself by the fire — well, just about! Now, don’t miss out! As you gear up for your new year, is there anything I can help you with? What projects do you want to do? (Create a blog, write a book?) What changes do you want to make? (Get rid of nagging pain or migraines, go vegan?) Where are you stuck? What needs fine-tuning or a restart? My work has propelled my clients to feel fantastic, fulfill their dreams, and accomplish great things. Let’s make the magic happen! 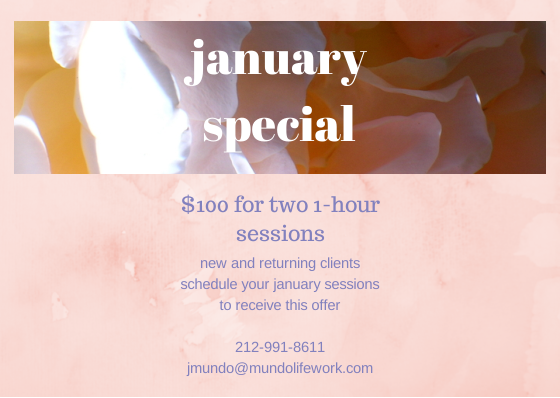 Whether you’ve been wanting to return for sessions, refer someone, or experience for the first time what my work can produce for you, I’ve got just the remedy: the January Special! I work in-person, by phone, and online. Be in touch, thank you so much, and here’s to a fabulous 2014!